Darren Allison trained at Ezee Studios, assisting on Robert Plant’s ‘Manic Nirvana’, and Tina Turner’s ‘Foreign Affair’ albums, as well as engineering for Propaganda, Jesus Jones and Dave Stewart. Inspired by the sessions with Dave, he moved to the Eurythmics Church Studio in 1990, and remained there for the following five years. In that time, as well as performing engineering duties with numerous rock ’n’ roll legends, Darren co-produced The Divine Comedy’s critically acclaimed album ‘Liberation’ on a tiny budget. Their second album ‘Promenade’ was also very well received by the critics and Darren went on to produce their third album ‘Casanova’ which contained the three Top 20 hit singles, ‘Something For The Weekend’, ‘Frog Princess’ & ‘Becoming More Like Alfie’. 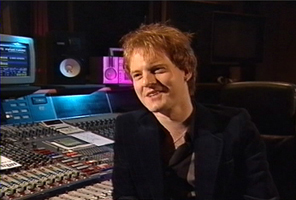 He was then invited to work with Jason Pierce, helping out with the production, as well as engineering and mixing tracks on the acclaimed Spiritualized album,‘Ladies and Gentlemen we are floating in space..’ In the following year he produced tracks for Babybird and Ben Christophers, and also recorded tracks for Electronic, and Skunk Anansie. Darren then went on to produce a hit single for Italian pop diva Elisa, and two hit albums for one of Portugal’s biggest rock bands, Hands On Approach, as well as mixing tracks for French genius Dominique Dalcan. He worked with flamenco guitar virtuoso Juan Martin on two albums, which included sessions with Jazz giants Flora Purim and Airto Moreira, and then, in contrast, he mixed the hard edged ‘10SR’ album from Irish rockers Ten Speed Racer, including their hit single ‘Fifteen’, and bbc radio one favourite, ‘Your Demon Heart’. Back in the U.K. for a while, Darren produced tracks for BB Mak and Belle and Sebastian, mixed the beautiful ‘Under The Skylon’ album for English band Candidate, and also collaborated with Ireland’s award winning Future Kings Of Spain on songs for their ‘Le Debemos’ e.p. 2007 found Darren in Copenhagen, Denmark, working with the mighty Efterklang on the mixing of their critically acclaimed, award winning album, ‘Parades’ . Later in that year, he was reunited with his old friends, producer Paco Trinidad and legendary Spanish diva Luz Casal, for her ‘Vida Toxica’ album. The sessions at the Townhouse Studio included such notables as Pino Palladino, Paul Wix Wixens, and Robbie Macintosh, with the Millenia Strings ensemble. This was one of the last major recording projects of the famous studio’s life. In 2011, Darren worked with Belgian stars Amatorski on their debut album, ‘TBC’, applying production touches, and final mixing. ‘TBC’ entered the Dutch Top 40, and reached the top 5 on Belgium's Album chart, receiving widespread critical acclaim, and multiple award nominations. 2012 saw Darren co-producing and mixing ‘Birdsongs On The Waste Land’, the second album from Belgian artist, Equinox, the Peacekeeper. Also in this year, Darren worked with Neo-rockabilly legends The Blue Cats, mixing their epic single, ‘Billy Ruffians’, which also appears on their much praised album ‘Best Dawn Yet’. In 2013, Darren added production and mixing work to a second Blue Cats single, titled ‘The Norton Spirit’, and by March 2013, Darren was contributing, once again, to the sound of Amatorski, with the mixing of the band’s new single, ‘How Are You’. Later that year, Darren teamed up with his longtime friend Clint Bradley for the production, recording, and mixing of - a dream realised - a modern day ‘Western’ album, titled ‘Riding After Midnight’. Subsequently, the praise for this project has been ubiquitous, with the album going on to receive multiple award nominations, and critical aclaim throughout the USA and Europe. 2014 saw Darren working with the amazing Dutch trio Daisy Bell, co-producing and mixing their forthcoming album, ‘London’, which marries original William Blake poetry with the band's own unique blend of acoustica/electronica, creating an eclectic, yet very musical and accesible, hybrid. In the winter of 2014/2015, Darren could be found working, once again, with flamenco legend Juan Martin on the production of a new album of guitar duets with Chaparro de Malaga, entitled ‘La Guitarra - Mi Vida’. Along with a deep love of music production, mixing, and the creative recording process, Darren is also a musician. Predominantly, he is a drummer/percussionist and guitar player. His drumming underpins the first three Divine Comedy albums, and his percussion work also pops up in numerous other places, from the opening theme of Channel 4 sitcom Father Ted, through the eponymous album of heavy rockers Girlschool up to the recent acoustic-led projects of Equinox, the Peacekeeper and Clint Bradley, to name but a few. Darren's understanding of arrangements and performance give him an all round confidence in being able to draw out the very best ‘feel’ from artists. He is based in London, and is always keen to hear from new emerging talent, and established artists, alike!